Before we get started with this post I wanted to invite you all to add a photo to our current "Shutter Love Tuesday" Link Party. 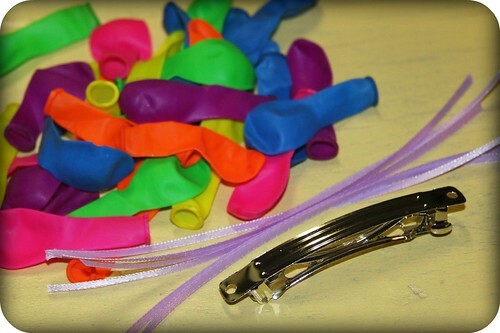 The theme is "Balloons" Tomorrow we will be posting the TOP 10 Photos and 1 Viewer Choice. So get your photo entered soon! We need more entries. Thanks! 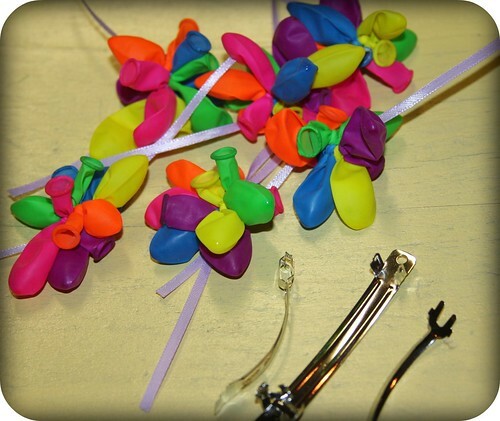 Now, Gather up some supplies for some fun new barrettes. I found a wonderful book online. And as you already know, I am addicted to buying Craft books. Yes, I had to buy it! 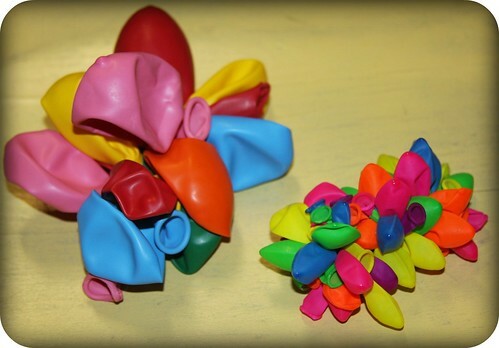 Today I am going to share with you a tutorial about the balloon barrettes. Aren't they cute! I can't wait to make various versions of these. I have so much in mind! First, remove the back metal pieces from the barrette. 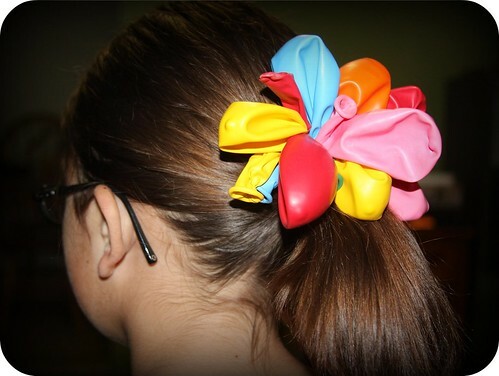 Take one balloon (add just a bit of air) and tie it to the barrette. 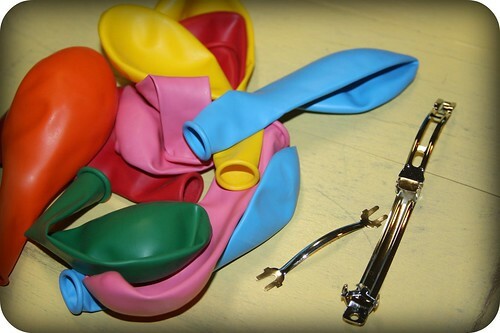 Continue tying the balloons on in alternate directions until you used all 10 balloons. This is what the barrette should look like on the back. Keep the knots on the top side so it doesn't interfere with the barrettes metal back pieces. Place the two metal pieces back on the barrette. And that's it your done. It is that simple. Look at how cute it looks in hair. 6 1/8" ribbons cut to 6" each (any color will do, they aren't going to show. 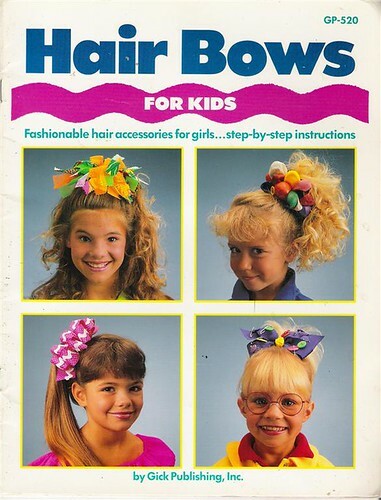 Again, remove the back pieces off the barrette and set aside. 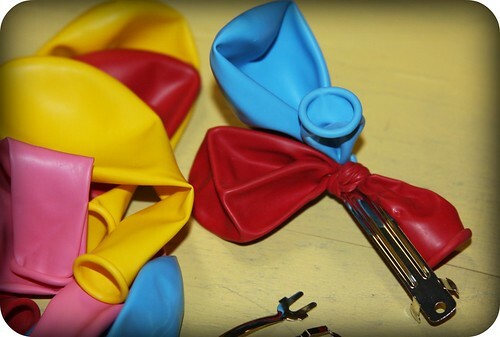 Start by taking 1 ribbon and tying 6 small balloons (filled with a bit of air) to the center. Continue making 6 clusters of these. Now you have the finished clusters. It's time to add them to the barrette. Double knot each cluster onto the barrette. Trim excess ribbons. 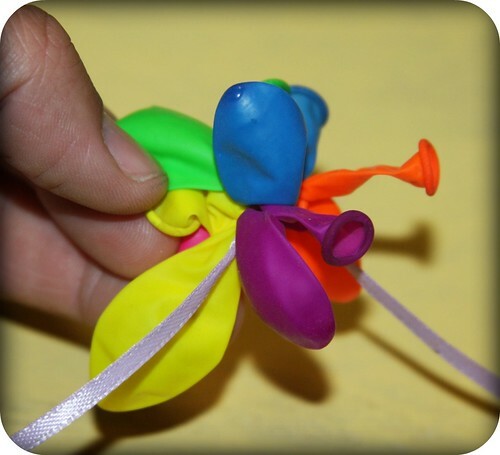 You can always use a little glue to the knots also to keep them from coming undone. I did. 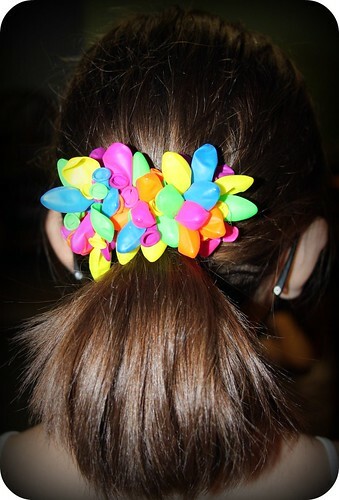 Add on your barrette pieces and done. 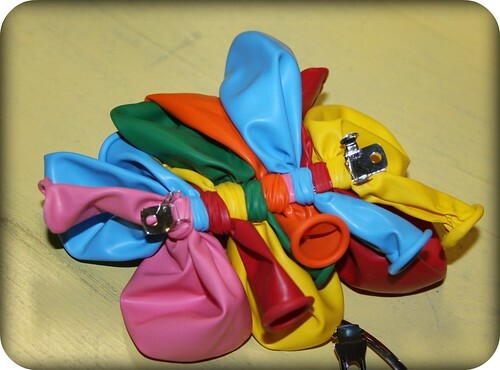 Another fun and easy balloon barrette. I love this one because it has so many balloons. It just looks so cute. Make them all in one color and splatter with paint. These are in the book too! They are adorable. They would make fun gifts too! There is so much you can do with them. Have Fun! Oh I am FOR SURE doing this! Too cute! I hope you share more of those ideas! LOL! Thanks girlie! Your welcome. I had fun making these. I will be posting another tutorial that I learned from this book very soon. I think these look super fun to make! Just adorable! I spend a fortune on hair bows, that are almost immediately lost! This is a great book - I'll have to be extra frugal and first see if our library has it! Thanks for posting! 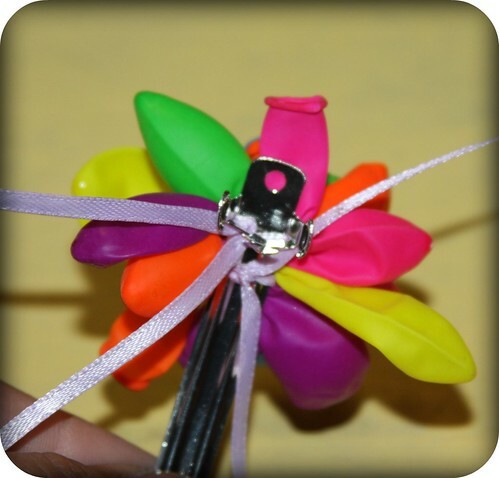 I absolutely love this post and the idea about giving them as party favors is brilliant! Thanks for sharing! I love how these turned out. I am definitely going to make some. Thanks for sharing this.